Those of you who enjoy raw vegan desserts will probably be familiar with This Rawsome Vegan Life, which is run by Emily von Euw. Emily's raw vegan carrot cake provided inspiration for my version of the same, and I regularly admire her fresh, beautiful creations. She's not all about desserts either - drinks, savoury snacks and meals also grace her blog pages. 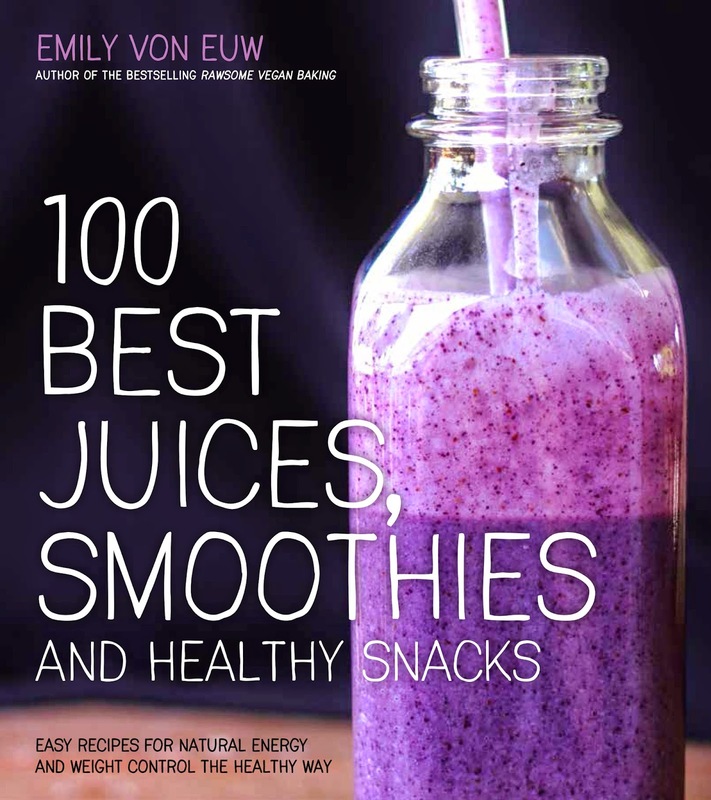 I am thus pleased to provide a review of Emily's new book, 100 Best Juices, Smoothies and Healthy Snacks. The book is delightfully diverse, with recipes such as carrot, apple and lime juice, chocolate mylk, power bar snacks, and the berry citrus blitz smoothie that I chose to test out. What is more, you don't need a juicer to make use of the book. Most of the recipes are made in a blender, whilst the snack items use a food processor. The berry citrus blitz smoothie seemed like a nice way to offset grey winter weather, and if you live in the southern hemisphere, it will be an equally good match for your sunshine! Emily recommends a mix of berries for the smoothie, and you can use whatever you have to hand. I combined cranberries and raspberries and they tasted wonderful and gave a gorgeous colour to the drink. The smoothie was impressively thick, and I don't usually use oranges in smoothies so appreciated the different flavour and sweetness it provided. Blend until it’s all smooth. Sip and enjoy. I was provided with a copy of Emily's book in order to write this review. I received no other compensation and all opinions are my own. What smoothies are you enjoying at the moment? I do love the colour of it - really vibrant. This looks amazing!! Her website is so great! ...and so is yours!! :) Thanks for sharing your review! amazing colour and am still jealous of your cranberries - also interested in the mixture of orange and nut milk - I usually think it is a choice between orange juice or milk in smoothies - so I think I need to try this as we have too many oranges right now! I always thought that too - orange juice (or any juice) or milk but not both! I was really delighted by how well it worked as the milk gave creaminess whilst the juice made it sweeter and not too milky. There didn't seem to be any problems with curdling. This would address your orange problem and perhaps also the extreme temperature problem as I've noted the predicted high temperatures in Australia this week! I didn't manage this with the oranges but made a smoothie with milk and mandarins this morning and thought of this post which encouraged me to pair citrus and milk. Thanks. I hope you liked the mandarin twist! It sounds great to me. It is definitely very refreshing! Just the thing to brighten up winter days but also of course to cool down hot ones. Thanks Kate - I hope you enjoy it if you test it out! Sounds like an awesome book! I'm definitely looking to hop on the smoothie bandwagon and this sounds super inspirational. I really need to get back on the smoothie train, thanks for the inspiration! We'll be eating healthier around here starting now and a small morning smoothie along with oatmeal will be the norm. This one looks really good! I hope you enjoy your new routine!